Eat. Live. Laugh. and sometimes shop! : I'd like to thank the Academy. First off, some exciting news: Eat. Live. Laugh. and sometimes shop! is now www.eatlivelaughshop.com! That's right -- the ".blogspot.com" training wheels are off! Please make sure to update your bookmarks. but please double check and let me know if you experience any problems. And in other exciting news . 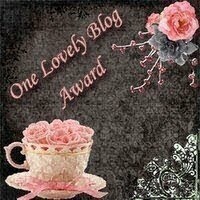 . .
this One Lovely Blog Award! It so nice to know that people are reading and enjoying my content! 3. Let them know I think they too are lovely! Congrats on being awesome! Found you on mommybloggers...you have a great blog! Love it and now following. Check out mine if you wish! Congrats on the switch to your own domain! I made the switch about 2 months ago. You are doing a great job! Congrats! I just found your blog. I love it! By the way, I'm having a giveaway, so be sure to check it out! I'm a new follower! I found you through Thirsty Thursday Blog Hop. Wow! Thank you! I'm honored! I will be picking this blog up this weekend on my blog :-) I heart awards...warm fuzzies all around! Congratulations! It is a well-deserved award. You never fail to entertain me! And thank you so much for naming my blog. What an honor! Congratulations on the award and on your new domain! That's so exciting! :) I've placed the award in my handy little trophy case (which can be found in the menu on my blog's home page) linking back to you. Again, congratulations and thanks for stopping by the other day.